The meet is also the selection event for swimmers in the above classes wishing to compete at the November 2017 Inas World Swimming Championships in Mexico. In addition to a full pool meet, this event offers swimmers the opportunity to compete in the first-ever US open water national championships (1k and 3k). This is an optional event for those swimmers capable of and interested in open water swimming. For those not competing in the open water event, Saturday is a free day to enjoy the Atlanta area. 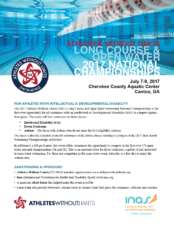 ELIGIBILITY: Swimmers seeking eligibility for the 2017 Athletes Without Limits Swimming Nationals: Athletes with Intellectual Disability should complete AWL’s INAS eligibility application seeking “National Level” eligibility. For the additional pilot classes for Down Syndrome or Autism+ (IQ over 75) please email documentation showing diagnosis to info “at” athleteswithoutlimits.org. Please submit eligibility documentation by July 1st, 2017. We welcome the support of the local community through sponsorship and volunteer opportunities. Sponsor benefits range from on-site logo placement to promotional opportunities to social media mentions. Please contact Catherine Brack for more details on sponsorship by emailing catherine “at” athleteswithoutlimits.org.